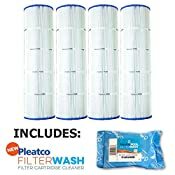 Includes Four (4) Pleatco PA106 Filters and One (1) Filter Wash Replaces the following Cartridge Filters: Hayward Swim Clear C4025/C4030 CX880-XRE Unicel C-7488 Pleatco PA106-4 & PA106-4-M Filbur FC-1226 Aladdin 20601 20601SVP Filter Dimension & Specs: Diameter: 7" Length: 25 1/2" Top Hole: 3" Bottom Hole: 3 " Area: 106 Square Feet Media Weight: 4oz Pleatco filter cartridges center around a completely unique, uniformly bonded filtration media driving super-charged cleaning performance, vastly superior to anything that has come before. 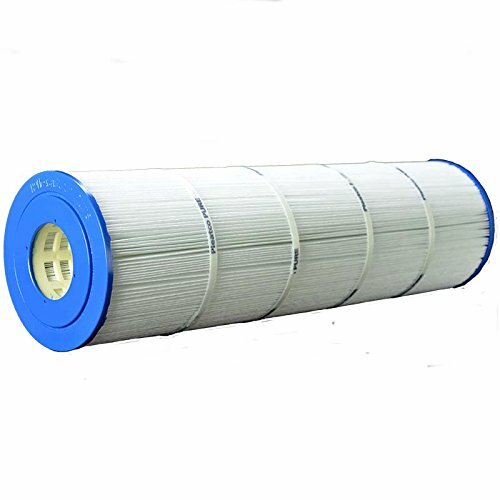 Their 4oz bonded media contains more fibers per unit area offering far greater volume dirt holding capacity than other filtration fabrics. Due to uniformly placed weld spots, their advanced bonded fabric is strong and robust, and returns to a high state of original performance after cleaning, meaning greater usability, longer cleaning cycles, and less service time. The Free Flow Core Technology consistently delivers lower pressure and higher flow rates resulting in a regulated gentle flow that uses less energy, creates less wear and tear on the pump and ensures a longer life of the product. Advanced Filtration Fabric - 4oz media with the highest fiber count, holds more dirt. 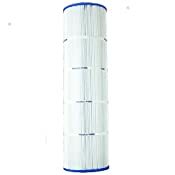 Free Flow Core Technology - Better flow rates, increasing filter life. Longer Service Life - Clean less frequently and lasts longer. Antimicrobial End Caps - Inhibits growth of bacteria for the life of the product. Super-Bond Bands - Break resistant keeping the pleats crimps, clearly defined and evenly separated.